Welcome one and all, to the One that Binds us. So, this is my very first contest. I’ve been on Booksie for quite awhile now and recently decided I should probably try hosting one. I’ve got this mental list for writer like things I must do. NaNoWriMo one day, hosting a contest and (hopefully) being successful, haha, and getting published eventually, but before that comes actually writing a proper, publisher worthy book…. But wait, this is a contest for you guys, not an article of all the different things I’m going to attempt in my writing life. 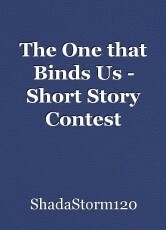 First of all, this is a Sci-Fi, Fantasy Short Story contest, meaning, only short stories can be entered. Pieces must be new and under five thousand words. Sci-Fi and/or Fantasy must be the main genre. It can include a bit of romance, mystery, or any other genre as a subgenre. Right, onto the next thing :D Ruuulllleesss. Must either be Sci-Fi and/or Fantasy, with a sub-genre if you wish. I’ve already said this above, but now I’m bullet pointing it. Must be a short story. No novels. No poems. As much as I love reading poems, I just cannot leave decent comments or review them as equal since I’m not much of a poet. There is no real minimum as long as it includes the information it needs. Please include a word count. It can be at the bottom of the story or just in the summary, or both if you so desire. Also, please minimise your strong language. I’m perfectly fine with swearing even if I don’t swear myself, but if you are to use it, make it count. I admit, there may be a few moments where a swear word can really impact a story, but if it doesn’t, then it doesn’t really need to be there. And no erotica please, or anything extremely graphic. I mean, if it’s gore graphic, I’m fine with that. I’m also fine if people manage to terrify me, in fact, try to. I don’t read much thrillers or horror. Well, I think that was the last of my rules, haha, now for the deadline. Deadline: After you finish and publish your short story, comment below its title before the 4th of December. Anytime after the deadline and you will be disqualified. I will remind authors one week before it is due. Results: I’m allowing myself one week in order to look through all the stories and rate them, so the results will be up on the 11th of December. Every writer has the chance to get a score out of 100. There will be several factors in which I will take into account when it comes to rating them all. Basically, I will treat scoring as if I were reviewing. When all's said and done, I will pay each story a visit, read them and leave a comment with their score. So this is where I hope the struggle was worth it, haha. My prizes are a little different than the usual fan and reading requests, although they’re included, haha, but I’ve got quite a few more than just that, so hopefully, there is at least one you like. So, I’m going to have first place, second place, third place, as well as three runner-ups. Hope enough people enter for this to really take off, haha. First, to any and all who submit a story, you will receive, come voting day, a longish comment on your piece, with how I rated it. Comments will hopefully be relatively thought out, so if you don’t want a comment with me nitpicking at it, you might not want to enter. I can get very into it, so no telling how long the comments will be, haha. Anyway, think of this as a prize for just getting your story in. It’s a good prize for those who want to know ways to improve. Also, for being first, you are the first to pick out of one of these extras. You can either get a ‘Shada Comment’, as a few people have called them. This is basically the longest comment you can ever imagine. They get as long as 2000 plus words, filled with any and all thoughts that come to my mind. This is great for those who are willing to listen to my views on how you can improve your writing and want long comments. They are made to be highly critical, so be warned. Option 3 is a drawing. (Note: It may turn out slightly cartoony and the quality will, of course, depend on what I’m drawing, like, I don’t often draw people very well, but I will be willing to give it a try if you want a character drawn). Don’t want a drawing? I’ve got one last option, option 4. This is where a character of your very creation is featured in my upcoming pirate novel. If you pick this, I will private message you a detailed form for details on character, including the fate and stuff you want me to give them. That’s the last of my prizes, but what about if you get second. Well, Second place will receive three reading requests aside from your entry. The details are the same as first, just less in number. You will also get a fan from me if I’m not already your fan. plus, I will give you a ‘Booksie Logo’ as well, and whatever the first place winner doesn’t pick out of option 1, 2, 3, or 4, you get to choose. So you’ll have three options to pick out off. As for third, you will receive two reading requests aside from your entry. The details are the same as first, just less in number. You will also get a fan from me if I’m not already your fan. 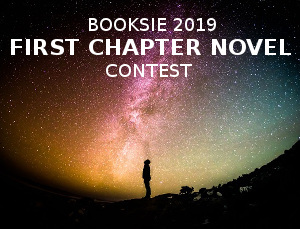 plus, I will give you a ‘Booksie Logo’ as well, and whatever first and second place winner doesn’t pick out of option 1, 2, 3, or 4, you get to choose. So you’ll have two options to pick from, meaning one option won’t go to any winner. This is just so third (hopefully) doesn’t get stuck with something they really don’t want. Instead, maybe something they mildly don’t want? Hahaha. Last but not least, all three runner-ups will receive one reading request aside from their entries. The details are the same as first, just less in number. They will also get a fan from me if I’m not already a fan, and I will also give you a ‘Booksie Logo’, but you do not get to pick out of any of the options like the others do. Here I will put the contestant's names, the name of their piece when they enter it, and the element they picked. rickybelmont- Fire - The World Can’t End Here!! JW wrote an amazing piece with realistic characters despite the fantasy setting. As a reader familiar with Dexter's style, this was one of his I must have enjoyed the most. I truly got into his dark and tradgic plot he came up with to go with the prompt I gave him. MELEL did a fabulous job with this story. It was so engaging and I really enjoyed it. The Dawn in this story was the true Dawn. That's the theory my brother came up with, since she was aware of exactly what she was doing, jumping from life to life, story to story. My brother said her true motive was to erase all other Dawn's from existence so she was the only one left in the multiverses. Haha, but anyway, trust me when I say, it was hard picking a winner. C A Sechler, Miss Midnight and ShadowLight120 all wrote incredible stories, and I loved them, along with those who didn't place, very much. Well, you can count me in for this, Shada....I think I'll go for 'Fire'. Haha, yes, it's a very hard decision. I know if I were to enter my own contest, I'd pick fire. I've always been a fire girl, haha. I'm in there like swimwear. Soooo... water! Here's my entry, Shada. It is 2210 words long. This looks like so much fun! I'm looking forward to it. :) Count me in as fire please, thank you. I'm categorising Earth or Terra under Life here, haha. Earth usually means ground and grass, but I feel Life brings it to a wider scale, animals and all living creatures. Imagination is my strength. Bring the pain as I burn in FIRE. Lol. Plus that character you put in for us to use, almost defines my character Alice in my book. Can't wait to see the prompt. Okay, going for it! Hit me up with Life! I'll enter with air please. Dark or Sad Short Story Contest! !